There’s no such thing as run-of-the-mill legal research, says John F. Buckley IV, who knows a thing or two about the subject. Buckley is the president of the oldest and largest legal research firm in the U.S., the National Legal Research Group (NLRG). The firm, founded in 1969, offers what it calls “specialized legal research firepower” for law firms and individual attorneys, many of whom are facing cases that involve issues for which there are few, if any, local legal precedents. Services like these are crucial to firms and lawyers who want to compete with big practices, but lack their resources or expertise. Based in Charlottesville, Virginia, NLRG has regional offices in Colorado, Florida and Texas, but assists attorneys in all 50 states. It’s a lot of ground to cover for a staff of 35 lawyers, especially considering they don’t just do the research but write memoranda, appellate briefs, motions, pleadings and multi-state surveys. Buckley says that in many cases, NLRG will act as a consultant to attorneys through the whole trial process, advising them on whether or not they should even take a case and then helping them draft pleadings, arguments and briefs. NLRG has worked on over 173,500 cases since its inception, and Buckley explains that the secret ingredient to handling all of them with just a few dozen people is experience. Experience comes into play when litigating cases of first impression that have few local precedents, and Buckley says his team of attorney-writers will research analogous cases in other jurisdictions to craft an argument. For example, in a 2014 case in Virginia, former union employees of Verizon filed complaints that the company had committed fraud by offering them a severance package under the false pretense that it needed to lay off workers. The circuit court initially dismissed the claims, finding that Verizon was covered under the Labor Management Relations Act (LMRA). However, there were few precedents for the case, so the attorney representing the employees reached out to NLRG attorney, Jeremy Taylor, for help drafting an appeal to the Virginia Supreme Court. The appeal successfully argued that the employees’ claims were not pre-empted under the LMRA and the Supreme Court reversed the decision. In another case, the firm prepared a memorandum for an attorney representing a husband who lost his wife and unborn child to a car accident in 2015. Originally, the widowed husband was unable to collect damages for his unborn child, but NLRG attorney, Steven G. Friedman, cited a 2012 addendum to Virginia state law that lets families recover damages for unborn children in certain cases. 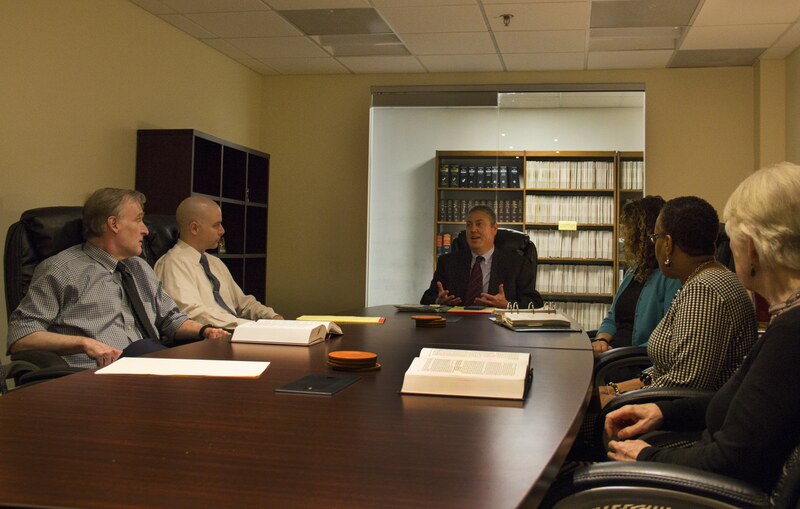 To craft airtight arguments that leverage legal precedents from one jurisdiction and apply them to another, NLRG hires attorneys who have specialties, not only in research and writing, but within subsets of the law. Buckley says this trend of attracting and hiring more seasoned attorneys has helped NLRG offer more comprehensive, complex services over its nearly 50-year life. It has also adopted better technology, including legal databases that will speed up research. “We’ve given a lot of attention to how we can be more efficient and make our services more affordable [by using technology],” Buckley says. NLRG not only uses the tools available to other firms, but also has developed its own database to increase efficiency. In addition to writing briefs and consulting, many of NLRG’s attorneys, including Buckley, write books. A musician throughout College, Buckley considered becoming a rock musician and even obtained a one year deferment from entering law school to tour with his band. Buckley has written several books—some, like “Defense of Equal Employment Claims” are aimed at helping attorneys and others, like “The State by State Guide to Human Resources Law” help HR professionals stay compliant with changing laws and regulations. He says his books rank among his proudest accomplishments, not only because they require a tremendous amount of work, but because they help people both in and outside of the legal field. It’s unlikely Buckley will ever stop writing. A musician throughout College, Buckley considered becoming a rock musician and even obtained a one year deferment from entering law school to tour with his band. He still makes music, but since his undergraduate days, Buckley’s professional attention has been squarely on legal writing. He says that while other students were fantasizing about litigation, he was in the library, envisioning his name on the spines of legal tomes.